A busy thoroughfare in Seoul. Photo credit: K-Developedia. The Republic of Korea upgraded its bus transport system in the early 2000s into a green and sustainable urban transport system. This involved a semipublic operating system for strengthening public access, route reforms for enhancing accessibility of users, expanding bus infrastructure (e.g. exclusive median bus lane) for improving punctuality, and adoption of transfer discount and smart card systems for affordability and convenience. Moreover, the government introduced a Bus Management System (BMS) and a Bus Information System (BIS) to provide operator-centric information of buses to the users which will result in maximizing passenger convenience and expanding demand for buses. Likewise, these reforms are aimed at enlarging functions of buses as sustainable green public transportation in urban areas. To institutionalize a green and sustainable urban transportation system, multimodal public transportation system connecting subways, buses, taxies, and pedestrians lies at the core of reform efforts. The existing public transportation system with public-owned subways and private-owned bus operations made such an effort a formidable one where strong material interests resisted any major changes to the existing system. There is also a need to address growing citizens’ dissatisfaction from heavy traffic; unpredictable commuting time; frequent delays, long commuting time; transferring subways and buses; and public safety, etc. Further, there is a need to change the system which is favoring service providers over customers.and to address the business interests of stakeholders and their positions. The Seoul Metropolitan Government conducted an analysis of the strengths and weaknesses of the public, private, and semipublic bus operation systems in the Republic of Korea and countries overseas, and settled upon the semipublic operation system as the model most suited to Seoul. Introducing such a system, however, required a channel through which Seoul City could engage in continuous communication with the private sector. The Citizens Committee for Bus Reform (CCBR) was thus assembled to coordinate the public-private communications needed and handle tasks related to bus reform. 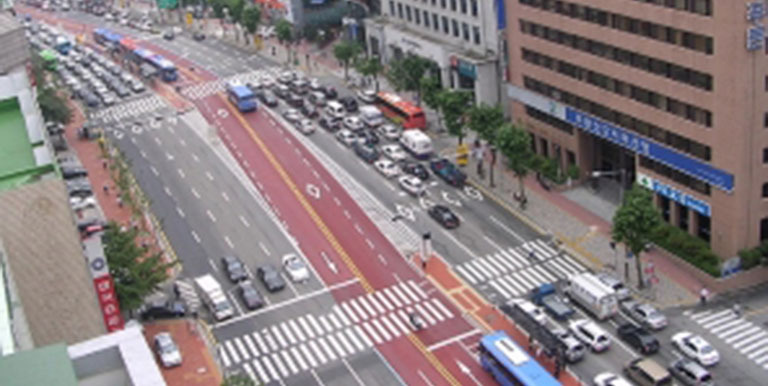 Seoul Metropolitan Government also decided to increase the number of routes with bus-only lanes along trunk roads and urban expressways to 13, creating a total of 170 kilometers of exclusive bus lanes. Under Phase 1, six of the 13 bus routes were to be completed in 2004, and seven more were to be added in 2005, under Phase 2. As citizens became more familiar with the new lane system and bus stop designs, the congestion along the exclusive median bus lanes began to clear up, and buses started operating at a faster pace. Seoul’s Bus Management System (BMS) was introduced with the overarching objective of improving public satisfaction with bus services by amassing and processing massive amounts of data relevant to improving the punctuality of buses and developing better bus policies in the future. The BMS is intended to benefit all stakeholders involved. Bus passengers and citizens, for example, benefit from the real-time updates on bus services and related information. In addition, the BMS aimed to minimize errors in headway, reduce passenger discomfort associated with excessive speed and aggressive driving, and reduce the time passengers spent waiting at bus stops by providing good estimates on when the next buses would arrive. The introduction of the semipublic operation system has ushered in important changes. Most notably, it has helped solve a number of chronic problems, including the excessive concentration of bus services in certain areas, alienation of other areas, and the excessive and diverse nature of bus fares. The introduction of exclusive median bus lanes has greatly improved the speed and punctuality of buses. Today, the headway between buses traveling in these lanes is about two minutes, at most. Considering that the headway between subway trains is one minute, buses are now almost as reliable and punctual as the subway system. As buses running in median lanes now drive in straight lines for the majority of their routes, passenger discomfort has been minimized, and their sense of safety has been enhanced. The “bus trains” that used to clog up Gangnam-daero have all but disappeared, and more than 10% of all vehicle passengers on this main road at any particular moment are now bus passengers. The BMS, as well as other information systems operated by bus companies, also provides real-time updates on accidents and other road-related conditions, thus helping to reduce delays and accidents. Bus companies use special devices provided by the BMS to monitor the status of buses in operation on a real-time basis. More specifically, bus company operators can check the operating conditions of each route on a digital map of Seoul, instruct bus drivers on how to time their trips, and deliver other key pieces of information (e.g., regarding accidents and traffic congestion) that drivers need while driving. Bus companies also use the headway control feature of the BMS devices to chart the movements of buses along each route, thereby allowing them to better control bus drivers. Moreover, the BMS provides information on the passengers getting on and off buses based on transit card transactions, which facilitates the processing of per-vehicle and per-kilometer payment information required by the semipublic operation system. As excessively long bus routes, competition with subways, and lack of effort to improve service quality led to a continuous drop in demand for buses and increasing difficulties for bus operating companies, Seoul considered introducing a semipublic operation system to replace the private one. Therefore, Seoul Metropolitan Government conducted an analysis of the strengths and weaknesses of the public, private, and semipublic bus operation systems in the Republic of Korea and countries overseas, and settled upon the semipublic operation system as the model most suited to Seoul. Introducing such a system, however, required a channel through which Seoul could engage in continuous communication with the private sector. The Citizens Committee for Bus Reform (CCBR) was thus assembled to coordinate the public-private communications needed and handle tasks related to bus reform. KDevelopedia. Bus System Reform in Korea. ADB. 2010. Retrofitting Sustainable Urban Development Practices : Urban Public Transport. Research interests of Keeyeon Hwang include Transportation Demand Management), Public Transportation, Mobility as a Service, and Automated Vehicle Policy. His work has been published in reports of research institutes, such as Seoul Institute, Korea Transport Institute, and in books and scientific journals. He has worked for Seoul Institute, Presidential Office, Republic of Korea, Korea Transport Institute and Hongik University. He completed his BA in Public Administration and Policy from Yonsei University, Masters in Urban Planning and PhD in Urban & Regional Planning at University of Oregon, USA, University of Southern California, USA.